← 100 Foot Journey… Create Food Memories! What’s all this buzz about Superfoods? 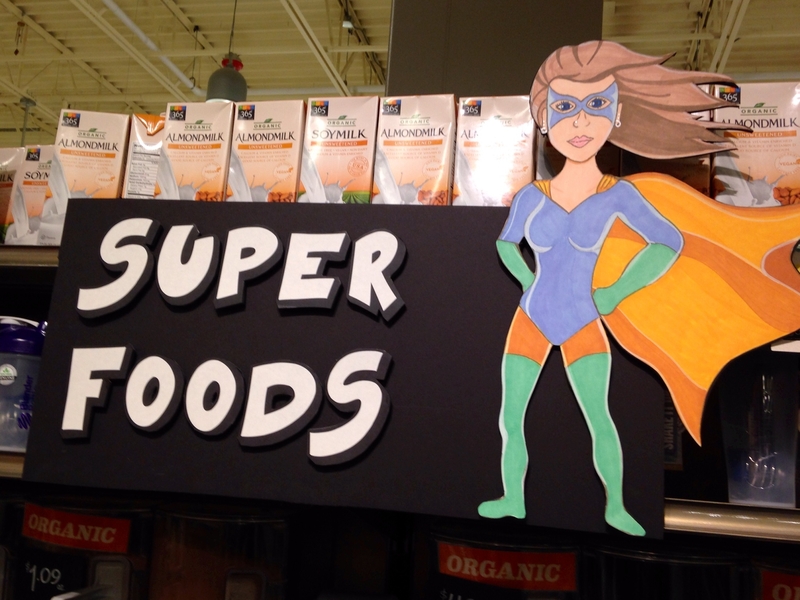 Is Superfoods just another fad that has a lot of media hype around it? I actually don’t think so! I know my opinion may not be popular with some dietitians, who think this is just another marketing ploy. But any “buzz” word that promotes the eating of unprocessed, whole foods that are nutrient dense and calorie sparse, shouldn’t be a fad but something we all embrace and promote. Especially when we are battling a billion dollar food industry, and their promotion of highly processed foods disguised as “health foods”. Superfoods is a word designed to describe foods that are believed to have multiple disease-fighting and athletic performance-enhancing nutrients. They are also meant to fill you up, so you can enjoy plenty of food without excess calories. If adding the word “Super” in front of blueberries or Chinese cabbage makes it more appealing to the masses then I am on board! The science behind the term Superfood is also getting stronger. This summer the Center for Disease Control (CDC) just released their first nutrition guidelines that emphasize consumption of these powerhouse fruits and vegetables. The foods were all scored by their content of fiber, potassium, protein, calcium, folate, vitamin B12, vitamin A, vitamin D and other nutrients, all considered important to health and prevention of disease. Majority of Americans go day in and day out eating supposed “health” food that is just junk food in disguise. The problem with these “health” foods is they actually make you tired, hungry and gain weight in the belly, due to all types of additives you probably can’t pronounce and hidden sugars that your probably had no idea were even there. What makes Superfoods, “SUPER” is when you start to include them at all your meals and snacks, your energy levels sky rocket, you feel less bloated, you hungers in control and if you stick with it you will lose weight and reach your athletic potential. If that is not enough many of the nutrients and antioxidants found in these foods fight and prevent a variety of disease. However here is the yellow CAUTION tape. Anything “healthy”, the food industry is going to play up and package. Be very weary of marketing claims. You need to proceed with caution on knowing what is a superfood and what is just junk food in disguise. You won’t find fortified potato chips in the superfood category and if you do then you should always question it. How to distinguish a Superfood from the Junk in Disguise? The food high in fiber (providing 3g or more fiber per serving) and/or high protein (providing 10g protein or more per serving). The food falls in one of the following categories: fruit, veggies, leafy greens, whole grains, legumes, nuts, seeds, fish. It contains NO artificial ingredients, food additives or contaminants. There is very little packaging, boxes or wrappers. The food is whole and unprocessed. Typically it is single ingredient product but not more than 5 ingredients total. To summarize and keep the message simple… Superfoods are WHOLE, UNPROCESSED FOOD! Looking for a list of Superfoods to get your started, check out dietitan Joy Bauer’s Top 10 Superfood list. And if you are looking to take your Superfood intake to the next level consider joining me for My Nutrition Upgrade’s Fall Detox with Superfoods. This is an online program that will help you get back on track towards healthier eating with fresh, seasonal recipes and tools to remove the stress out of your diet and Superfoods into your kitchen. 1 Response to What’s all this buzz about Superfoods?